I'm a little tired. I suspect the combination of waking up really early most days, exercising a lot, and not eating as much is wearing me out a bit. I do OK until the early afternoon...then it's like my whole body just says NOPE and an unintentional nap happens. Hopefully I'll adjust to this soon, or else maybe I should up my caffeine intake at lunch...mmm, a nonfat latte sounds pretty good, actually! Running has mostly been going well - I've enjoyed getting to know some of our new running club members on Saturdays as we do our "long" run (only 3 miles, which isn't very long), and I've been getting in my additional runs during the week. I am so used to our hot and humid weather that I forget how much it impacts a run, and I get down on myself for feeling slow and sluggish. Then I upload my Garmin and look at the stats, which include the weather, and I'm brought back to the reality that this IS harder right now because it's so warm. Yesterday Julia and I ran for 40 minutes. The temperature was 77 degrees, with 83% humidity...at 6:30 am! I'm going to work on cutting myself some slack with the less-than-positive feelings about my performance right now. Nuun, Gu Brew, and Camelbak Elixer - everyone had a different preference! photo swiped from Facebook via Guillory Photography. 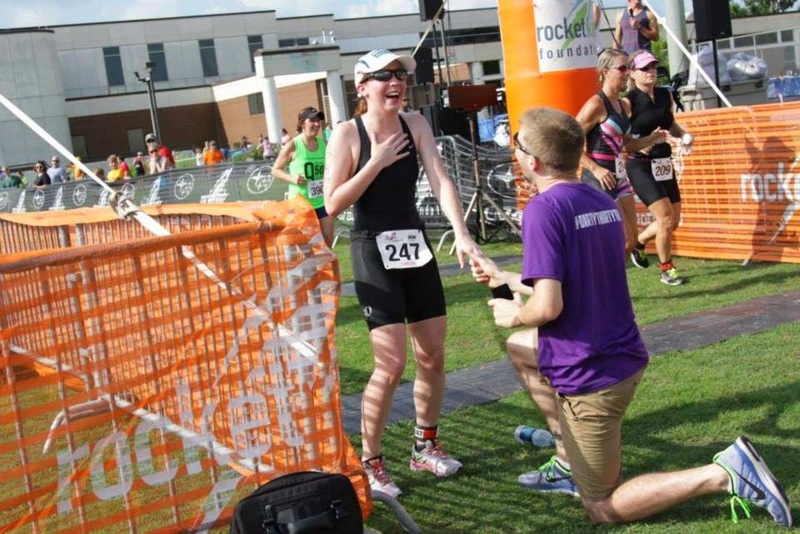 That's Coach Phillip proposing to Sarah at the finish line of her triathlon!!! He told me he was planning on doing this a few days prior (and he even showed me a picture of the ring) so I kept checking Facebook all morning as we were at Blue Baker, waiting for the news. They recently moved to Dallas and we've missed them so much; our Blue Baker breakfasts aren't quite the same without them. Big congratulations to the happy couple on their engagement! What a great way to propose, she looks all surprised and happy. Take care of yourself sweety, an extra rest day won't hurt you if you are tired. If it doesn't change after you are getting used to your new routine, it might be a good idea to take another rest day. And again .. I love your running club with all the extra activities they do. This morning I only worked out at PF, no running. That, plus two cups of Starbucks coffee, and I'm already feeling peppier. I bet you've lost your heat resistance by now. Nuun it up! When my running group was in existence my two favorite seminars were the hydration/fueling seminar and the shoe seminar. I'd say I learned most of what I know about that stuff in those classes. Funny that you mention the fatigue - my sister and I were just talking about how tired and hungry you feel on the first few days of new program lol! Why it takes the body and brain a bit to catch up to what you're doing, I don't know. But I know for sure it happens every single time I make a change! We have our shoe seminar tomorrow night - and I learn something new (or else hear something that connects) each time I go to one. I live near Burlington and Elon University. When I am in diet mode, I know that I do not have the energy to keep up the exercise like I usually do. I just don't try most of the time. Your exercise has been most impressive! Love the proposal. Best of all is that she looked so darn good at the end of a triathlon!!! She looked good at the finish line of her marathon last December, too! As for the running club ideas, we just sat at (at BB, natch) and came up with seminar topics, then tossed around ideas...mostly we didn't want people to be bored. Plying them with food and/or drink helps, LOL! Running shoes to not run in. You crack me up. I'll let you know what the hot new thing is (although I think I'm already onto that). Fatigue and all that? Yeah, I can sympathize LOL. If you don't adjust soon and have less fatigue, maybe you should consider adding a bit of protein or carb at a certain point in the day? I'm sure you know more about that than I do. I haven't figured this all out for myself yet, but I'm suspicious that hunger and energy issues are connected to what I eat, and when. I think you are awesome with all the running you do in warm weather! The summer heat could be contributing to your tiredness as well. Are you drinking enough?